There’s nothing like a weekend in the Big Apple. There’s just a certain energy about New York City – it’s exciting, it’s vibrant, it’s the city that never sleeps and it’s where everyone wants to be. Of course, with all its glory comes the city’s downfall: its core, Manhattan, is packed with overly-crowded, sometimes even overrated hotels. That’s why, when we’ve gone, we’ve made it a point to discover charming boutique hotels just outside its reach. Walk into this hotel, and you’ll notice it’s a little different. There are cinderblock walls, a communal dining room table instead of a “check-in” desk, and hand-scraped white oak floors. It’s like a new house you haven’t quite moved into yet, but with an industrial-chic, mixed-matched decor that’s oddly charming. There isn’t a ton of furniture, but what is there is purposeful. Think: cork stools, leather chairs, graffiti wall art that says "No Smoking," rooms with open terraces or balconies, and a rooftop deck with perfect views of the Manhattan skyline. Boro Hotel is located at 38-28 27th Street, Long Island City, NY 11101. This hotel is as environmentally-friendly as it is enchanting. Part of the Starwood hotel group, 1 Hotels have started a new movement, ecoluxury, and it fuses green-friendly traveling with the best of luxury. Spread across 10 stories, you’ll find a 25-foot “green wall,” a nature-driven art collection, hemp blend mattresses in every hotel room, rooftop fire pits, and marble rain showers with a timer that reminds guests to conserve water. The room keys serve a dual purpose: they’re actually packed with seeds that, if planted when you get home, will produce a colorful bunch of flowers. 1 Hotel Brooklyn Bridge is located at 60 Furman Street, Brooklyn, NY 11201. Once a textile factory, today, Wythe Hotel is still inspired by art. In a space that’s a canvas of arched wooden ceilings and exposed brick walls, modern art by emerging local artists practically jumps out at you. In fact, amidst original paintings, photography and standard drawings, some rooms even have more avant-garde artwork like woodblock prints, stop-motion animation installations, and even framed poetry written by someone in-residence. Want a memorable view? Head up to the rooftop. It’s idyllic. 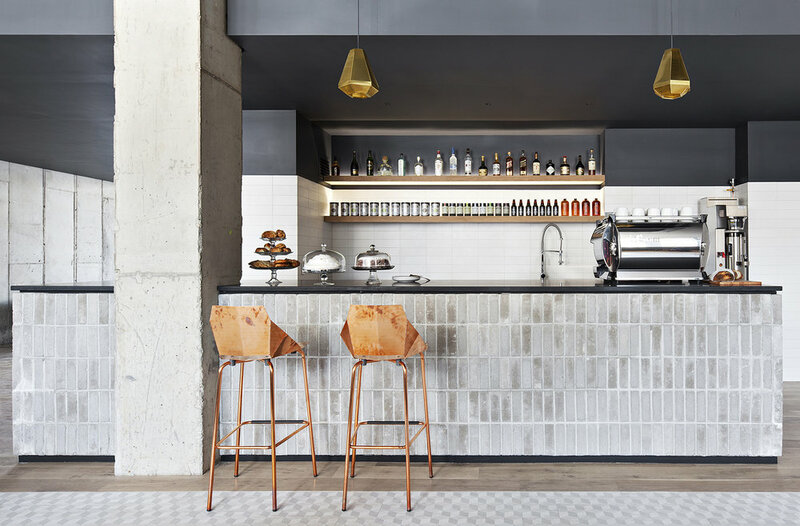 Wythe Hotel is located at 80 Wythe Avenue, Brooklyn, NY 11249. This cheery hotel is bright, light and all-around adorable. In fact, we’d go so far as to say it’s nearly impossible to be upset there. Sitting in Brooklyn, this boutique hotel has yellow club chairs, chrome accents and leather barstools in the lobby, and “green” amenities like recycled teak furniture, organic cotton sheets and biodegradable key cards for its rooms. For a real treat, book one of its three “Urban Suites” – they have in-room hammocks, cork floors and bathrooms with chalkboard walls. Nu Hotel is located at 85 Smith Street, Brooklyn, NY 11201. Once a 19th-century warehouse, today, The Henry Norman Hotel is the definition of “boutique.” In addition to a fitness room with both wet and dry saunas, this hotel has cozy business and fitness centers, and 50 loft-style rooms. Here, antique fixtures are juxtaposed with ultra-modern artwork, one-of-a-kind lamps, potted palm fronds, light wood floors and a colorfully-tiled dining room. Fun fact: this hotel was named for its cross streets, North Henry Street and Norman Avenue. The Henry Norman Hotel is located at 239 North Henry Street, Brooklyn, NY, 11222. This Long Island spot is where extravagance meets industrial-chic. Housed in what was once a paper factory (hence the name! ), Paper Factory Hotel has 12-foot-high ceilings, concrete floors and one-of-a-kind decor, like a spiral staircase that winds its way around a towering column that holds 4,000 books. There is a two-story restaurant and a coffee shop onsite that, when coupled with Paper Factory Hotel’s avant-garde design, makes it both cozy and interesting. Paper Factory Hotel is located at 37-06 36th Street, Long Island City, NY 11101. Space in NYC is hard to come by, but in this Brooklyn spot, it’s all you have. 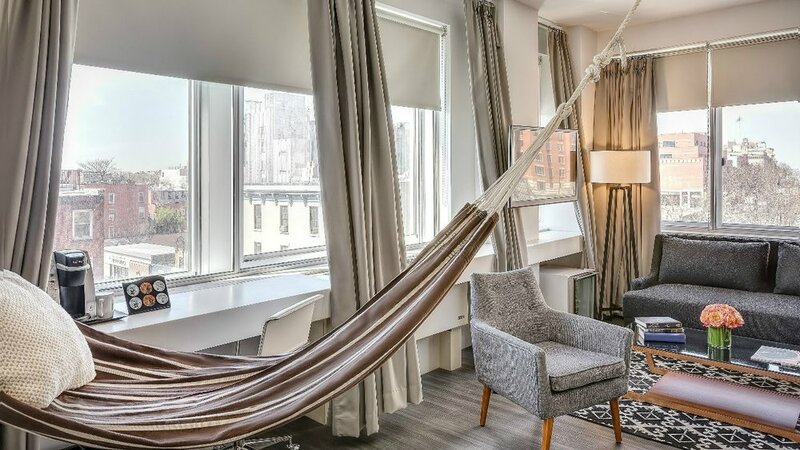 Different from even an NYC apartment, these 30 loft-style hotel rooms come equipped with dishwashers, kitchenettes, 13-foot-high tin-plated ceilings and oak hardwood floors. On top of that, the hotel itself has a self-serve laundry room, as well as a sauna and steam room. Here, neutral shades of taupe and gray are dotted with bold metallic accents, abstract art and sunlight streaming in through large windows. It’s cheery, chic and, like all things Brooklyn, weirdly bold. Franklin Guesthouse is located at 214 Franklin Street, Brooklyn, NY, 11222.